cap is up to 15 cm broad, narrow, cylindrical, white, and covered in thin, shaggy red/brown scales. older specimens have a cap that is bell-shaped. gills are narrowly attached to the stem and white/grey when young. the flesh and gills of older specimens liquefies into a black inky mass. partial veil leaves a ring on the white stem. grows scattered or grouped together in grassy areas covering decomposing wood. appears in early spring and late fall. has a pleasant taste with no odor; cook before eating. 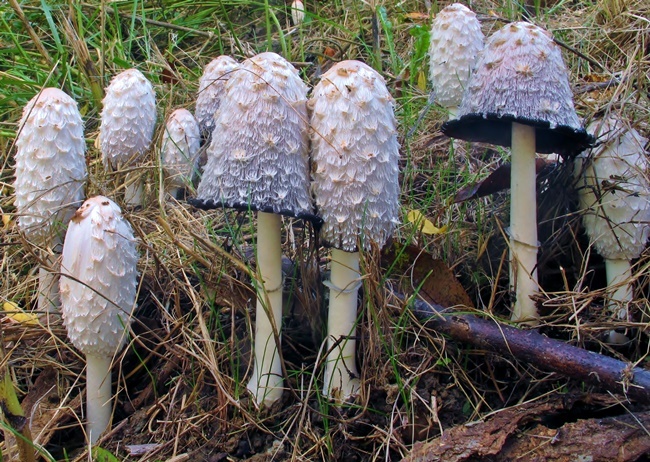 warning: only eat specimens that have elongated, cylindrical caps or have blackening gills in order to avoid confusion with other shaggy/scaly white mushrooms that may not be edible.